Your eyes are your windows to the world, but if you wake up with an eyeful of mucus, your first glance at the world can be a bit clouded. 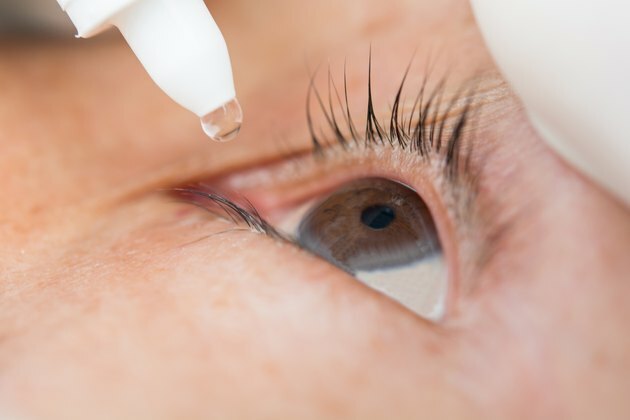 While a small amount of eye mucus is normal -- helping to rid the eyes of waste and debris -- an abnormal amount of eye discharge may be a sign of infection, dry eyes, excessive irritation or related to a stye or eye injury. Often, warm water and a washcloth are all you need to effectively remove eye mucus, but if an infection is suspected, you'll need to contact your doctor. It also helps to practice good eye hygiene to keep your peepers protected and healthy, and to prevent the spread of infection. The first step in removing crusted or thick eye mucus is to soften it first, so it’s easier to wipe away. Soak a soft washcloth in warm water, then gently press the washcloth over your affected eye for a few minutes to soften the mucus. Gently wipe towards the outside corner of your eye. If necessary, use the washcloth on your lashes to pull any large pieces of mucus away from your eye. If you have to repeat this process throughout the day, use a clean washcloth each time, and take steps to ensure other household members don't use your washcloths. A common reason for excessive eye mucus is conjunctivitis, which is the inflammation of the thin top layer of the eye. The affected eye may feel itchy and irritated, and white or yellow mucus will ooze out, crusting overnight. If caused by a bacterial infection, conjunctivitis is commonly known as pink eye, and treatment may include antibiotic eye drops or ointments. Pink eye is very contagious, so to prevent the spread of infection, avoid touching your eyes and wash your hands regularly. Conjunctivitis can also be caused by allergies or other irritants, so it's important to implement strategies to control the irritation at the source. For instance, a new face soap or old makeup may cause irritation, an so can wearing contact lenses too long. If you have conjunctivitis, avoid wearing eye makeup and contact lenses until the infection is cleared. Toss any potentially infected eye makeup and don’t share makeup with others. Stop using any soaps, perfumes or other chemicals that could be the cause of your eye inflammation. If allergies are the cause, work with your doctor on a plan to control your allergies which may include the use of over-the-counter antihistamines or prescription eye drops. While a small amount of eye mucus is normal and expected, consult your doctor if you have a change in the amount or color of your eye discharge. Yellow and green eye mucus in particular can indicate an infection. According to the Centers for Disease Control and Prevention, if you have conjunctivitis, you should see a doctor if you also have eye pain, blurry vision, intense redness or sensitivity to light. In addition, newborns and anyone with a weakened immune system should see a doctor right away if excessive eye mucus is present. Optometry and Vision Science: Official Publication of the American Academy of Optometry:Mucins in Contact Lens Wear and Dry Eye Conditions.